Miss 2 has given up her naps for good after 6 months of a steadily dwindling supply. In some ways it is nice that we don't have to cut visits and activities short to get her home for a sleep but oh, the days can be long when two sisters just can not leave one another alone. They are as bad as each other with the taunting and the bugging and the poking. 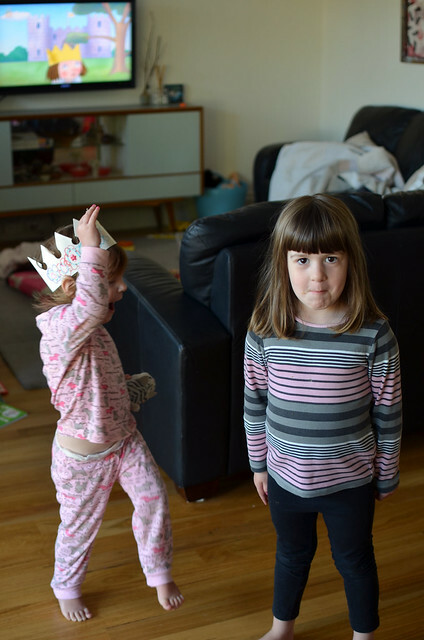 Even when they play nicely, it is usually in a wrestling match with giddy shrieks and screams that set my nerves on edge as I wait for one of them to injure the other or themselves and end up in tears. It seems if we're at home I end up doing far more yelling than I am comfortable with so we've been getting out of the house a lot lately. That's all good and well, we've done some great activities and are lucky to have similarly aged friends to make excursions extra fun but as a result, the house is an extra disaster as I am too busy breaking up fights to get half the things done I need to when we're home. And in the evenings, my work time, I am exhausted from the refereeing and the fun having and so am not getting as much done as I'd like. It's a bit tough, this multiple-job-juggling, at the moment. So my misprint & sample sale will still start on Thursday but it looks like it will be quite late in the day, probably around 8pm Melbourne time as I need the day to set up the listings and take a few more pics. I'll give an update on Facebook that morning to confirm the kick-off time. Thanks for understanding and don't forget to enter the giveaway(s) if you haven't already done so! I'm sorry you are finding the days hard - an idea, do you have a yard. I found it useful to order the kids out into the yard to find something to play with together, it usually worked, as long as you have a sandpit or swings etc. It's amazing how kids will amuse themselves if they have to and are left to it. Anyone who has ever had a two year old drop a day sleep understands. I have one in the "dwindling" stage! At least my other two are at school, so there is only me to pick fights with...until 3pm! Oh I so hear you at the moment. Mine are either fighting with each other or being naughty together at the moment. Constant arguments over who was first or who owns what toy arghhhh. So tomorrow's activity is to make those time out glitter jars. we'll see if that saves anyone's sanity! Oh my goodness, my boys are exactly the same. They can play so nicely but then Max will get sick of being bossed around by Ollie and will ruin Ollie's Lego or the like and then Ollie will shove him and then Max will bite him... it's exhausting. Like you, being outdoors helps and when we are around other kids they seem to be more protective of each other. Keep up the good work, you really do inspire people. I was a single parent with three kids under 8. Fighting really got to me. What worked to really diminish the squabbles was to take the attitude it was their fight and never try to referee. I would calmly state "I see you cannot play happily together now so you need to separate.'' I would then send them to play in different parts of the house. If they tried to involve me in solving their squabbles I would remind them it take two to make a fight and one could walk away to end the fight. I decided to never ever try and work out who was at fault etc. So much fighting is purely to get parental attention. Of course there were constant reminders about being gentle and no hitting etc. Any child observed breaking this rule earned an automatic cooling off time and then I discussed with them why using hitting etc was not allowed in our house. If they fight about a toy or any object I would simply remove it and say calmly "I see you cannot share this today. : and then the thing went out of reach for a few days. I always gave them one warning or gentle reminder. If they broke something that belonged to a sibling they had to replace the item with one of their own things or work out a way to buy a new one. If they removed an item from a siblings room without permission then the sibling was able to choose an item from their room to play with for a time. We had lots of discussions about how to problem solve at times when they were not fighting. This was the time to discuss feelings and what was fair or not. As for naps I suggest they both still have a quiet time in their rooms reading or listening to music or a story on tape. Good luck! Staying calm and matter of fact seems to take the heat out of these blow ups.